Coyotes are wild members of the dog family, intermediate in size between red foxes and wolves. In Minnesota, coyotes average 30 lbs., and stand about 18" high at the shoulders. However, they may appear much larger due to their heavy fur coat, especially in winter. They are gray/brown in color, and somewhat resemble a small German Shepherd dog in appearance. Coyotes in Minnesota are loners, except when families are raising pups. Their primary foods are rabbits and mice, but they are very opportunistic, and will feed on other small mammals, deer, birds, carrion, and even melons. Although coyotes can be found anywhere in Minnesota, distribution and population size is variable. Currently, populations are establishing and increasing in the Twin Cities metro area. Most coyotes avoid people and domestic animals, but occasionally they will kill sheep, turkeys, and calves. They may also raid garbage cans, and kill domestic cats and small dogs. While healthy wild coyotes avoid people, incidents have been reported in Minnesota and other states. Experts believe these incidents are more likely after a coyote has become accustomed to humans, or after being fed by humans. These simple suggestions should prevent most coyote problems. However, if depredation occurs or aggressive coyote behavior is observed, removal of the coyotes may be necessary. 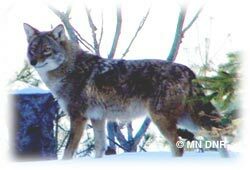 Coyotes are unprotected in Minnesota, and may be taken at any time by shooting or trapping, without a license or permit. The Minnesota Department of Natural Resources does not trap, shoot, or relocate coyotes. Where necessary, removal of coyotes is the responsibility of the landowner or tenant. For information on pest control contractors or trapping techniques for coyote removal, contact your local DNR Wildlife office or Conservation Officer. In cities with ordinances prohibiting the use of certain traps and/or firearms, you may need a city permit, or assistance from the city animal control agency.